We take pride in our friendly customer service, and are keen to help get your vehicle to where it needs to go! Southern Districts Towing Ltd offer 24 hour reliable vehicle towing services when you need it. Whether you need to get a small car towed down the road, or a large vehicle moved across town, we offer both local and long distance towing services. Our team of professionals take the utmost care when recovering vehicles, and guarantee a damage free recovery. We can also provide undercover storage for your vehicle. For more information or to arrange a tow, don't delay, call today. 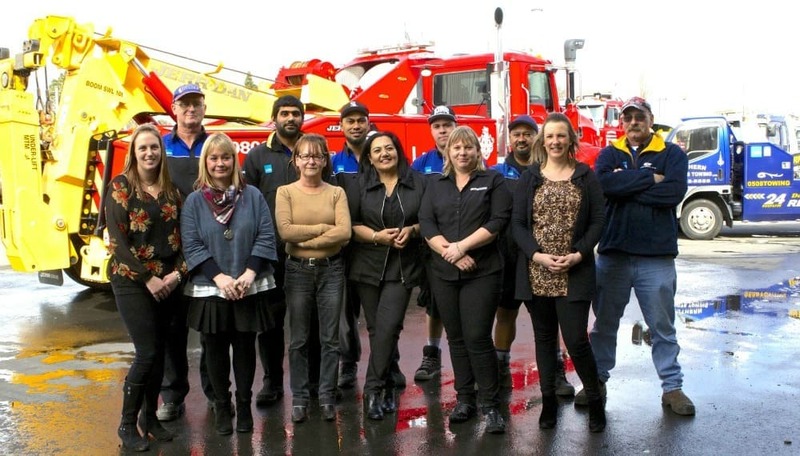 Founded in 1978 by Evan Watson, Southern Districts Towing and Southern Districts Heavy Towing has over 30 years experience in the industry, and continues to be a leader in the NZ Vehicle Recovery Industry. The company started with three trucks, and built on attracting work through local businesses, as well as government and corporate bodies. The reputation for legitimate and reasonable pricing remains and has served to enhance Southern Districts Towing within the industry. This continues to be a driving force for the team today. In 2009 Evan lost his battle due to illness. His wife Pam Watson continues with the business currently. We employ 30 staff, 17 of which are Recovery Operators, many of whom have long-standing service. Our staff are highly trained and have the expertise to respond quickly and take care of the many and varied needs of our customers. Our focus has always been providing our customers a prompt, fair priced service. We believe the above to be the key areas to our success and sustainability. Southern Districts Towing Limited currently services over 300 customers in the greater Auckland area including major Insurers, Breakdown and Recovery for AA and First Assistance, Ministry of Justice, Auckland Transport formerly Manukau City Council to name a few, and many trade customers. We are contracted to Counties Manukau Police, and have been for the past 20 years. We are also a preferred provider for Auckland Motorway Towing services for the NZ Police, and are a provider for Suburban Accident Rosters as well. We operate our business with the highest integrity and align ourselves with like-minded professional organisations. The companys mission is to: Lead Our Industry to a New Level of Professionalism. The Southern Districts Towing promise is that we'll be there for you in your time of need. When your car is at its least reliable, our team will take up the slack and provide vehicle towing to any destination you desire. Contact us in Auckland any time you need us and one of our drivers will be with you before you know it. Professionalism is the key to Southern Districts Towing's success. Our tow operators are highly trained and experienced, and have encountered a huge number of situations over the years. This means that whatever situation you find yourself in, our drivers can extract your vehicle safely, and in a way that keeps it damage-free. No one likes sitting around waiting, and this goes double when your car has broken down. Not only do Southern Districts Towing's vehicle towing experts respond quickly, wherever you are in Auckland or beyond, but the towing process itself is undertaken quickly and efficiently. This means less waiting for you, less hassle, and increased convenience. Personal Protective Equipment (PPE) is issued to all employees for specific tasks. We track and maintain our PPE. We log all issues of PPE, including the date of issue, and sign off employees for training theyve received, enabling them to correctly use the PPE. We have very clear health and safety expectations for all employees, and clear processes to follow when these expectations are breached. We provide our employees with health and safety information, training, and supervision to ensure they have the skills and knowledge to do their jobs safely. We check with our employees to ensure they have understood the information and training we provide. Lead Our Industry to the Highest Level of Professionalism.